One of the drawcards for me visiting Sarajevo was the history of this region – as well as an interesting emerging young art scene. Most people will know of the terrible 4 year siege of Sarajevo in the 1990s – more on that sad event in a later blog – but the city was host to another international drama 76 years earlier – and it is this event that interested me today … So off I head with research in hand to the Museum Sarajevo on the banks of the Miljacka River that runs through the city. And the story unfolds … Between 1878 and 1918, Bosnia-Herzegovina was part of the Austro-Hungarian empire and ruling over this vast empire was Emperor Franz Joseph 1 ( … if interested you can refer back to my blog posts from Vienna and Budapest for a bit more info … ). Towards the latter part of that period, tensions with neighbouring nationalistic Serbia ( who had already annexed Montenegro and Kosovo and now were laying claim to Bosnia ) were getting rather hot. The heir to the throne of the Austro-Hungarian empire was Archduke Franz Ferdinand, and in June 1914 he and his then pregnant wife Sofia ( the Duchess of Hohenberg ), made a visited to the capital Sarajevo. 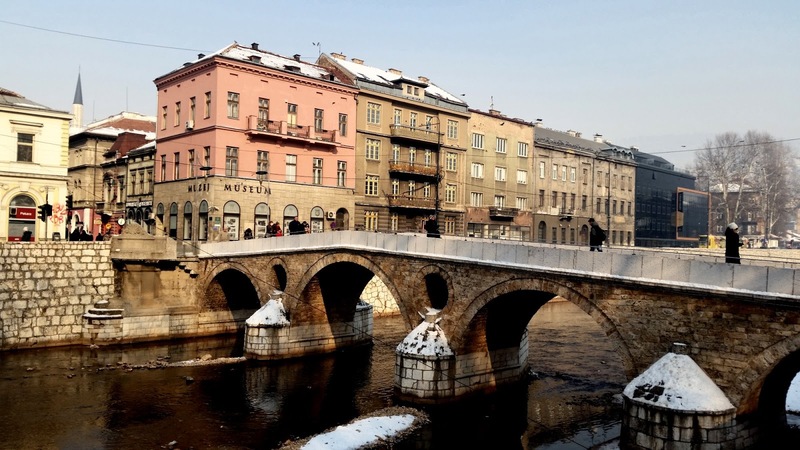 Unbeknown to the authorities and to coincide with the visit, a Serbian Bosnian underground organization under Dragutin Dimitrijevic, a group that went by the name "Black Hand" or "Young Bosnia", were plotting an assassination of the royals. 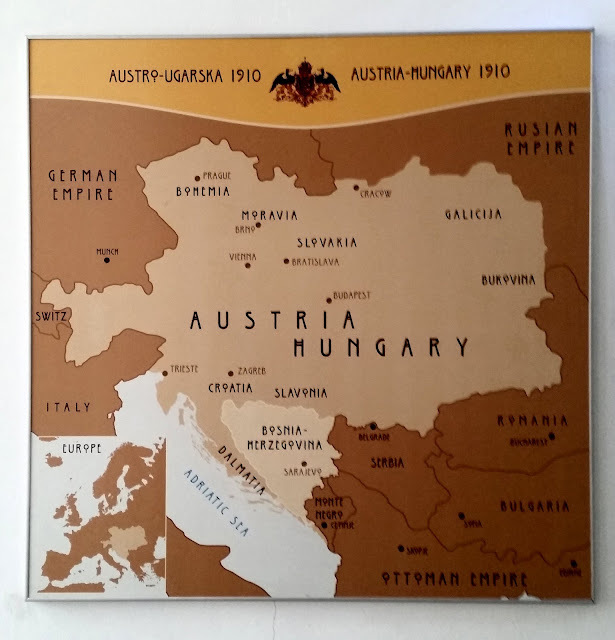 The assassination was supposed to help break Bosnia away from Austria-Hungary and ultimately facilitate a Serbian takeover of the province. 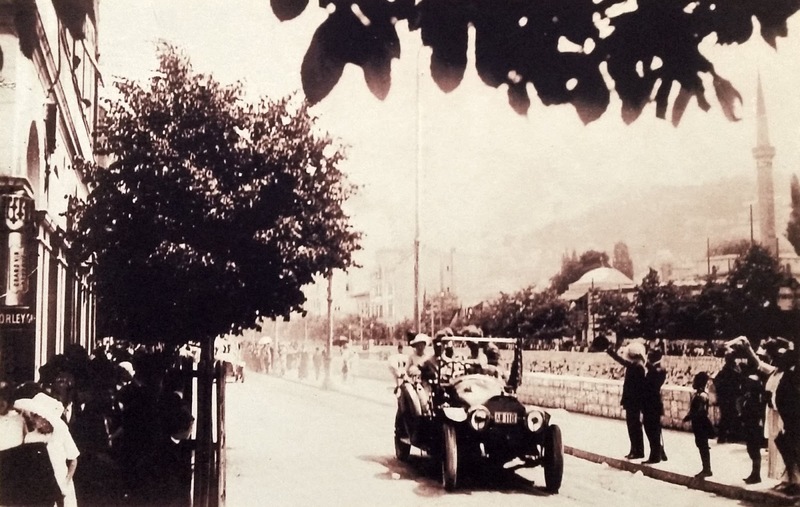 On the morning of 28 June 1914 Franz Ferdinand and his wife ( who were celebrating their wedding anniversary on that day ) were driven in an open-top car through the streets of Sarajevo to a civic reception at the City Hall, when the assassination plotters sprang into action. There were actually at least seven of the group strategically positioned along the car's route, but most either froze and were unable to carry out their attack or they were incompetent and they failed to take any action as the car drove past them. 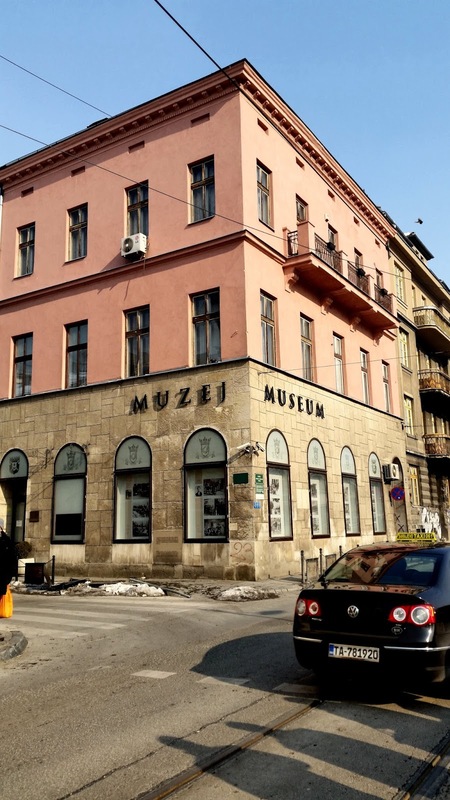 At 10:10 am, however, Franz Ferdinand's car approached a corner where one of the patriots, Nedeljko Cabrinovic was standing. Cabrinovic threw his bomb at the car. Sadly for him though, and many other people, the bomb bounced off the folded-back convertible cover into the street. The bomb's timed detonator caused it to explode under the next car in the procession leaving a deep crater in the road and wounding 16 people. Seeing his lot was up, Cabrinovic swallowed a cyanide pill and jumped into the Miljacka river. This suicide attempt failed for two reasons. The first was that the cyanide only induced vomiting. The second was that the river at that spot was only 6-inches deep due to the dry summer. The police dragged the hapless Cabrinovic out of the river and he was promptly beaten by the crowd before being taken into custody. 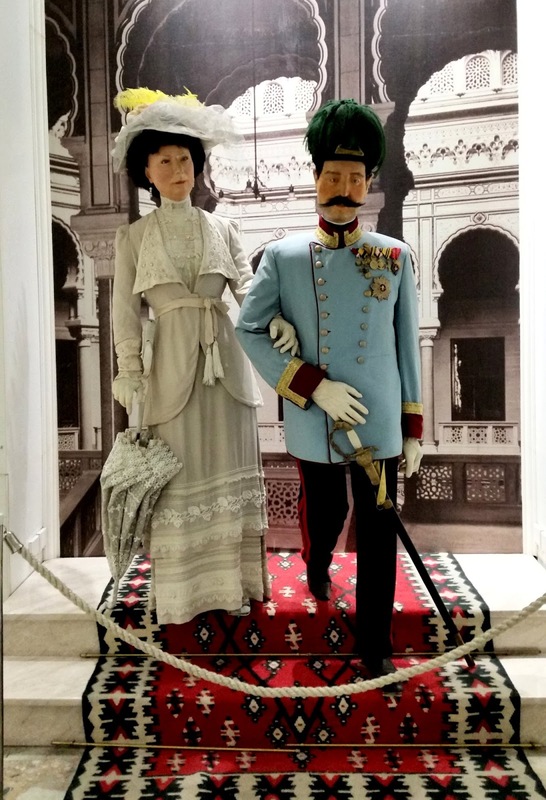 Franz Ferdinand and Sofia continued at great speed on their way to the City Hall where he complained, perhaps not surprisingly, about the welcome he had received. Following the reception, plans for the return journey were then changed, although the driver of the royal car forgot and followed the original route. When he was reminded of his wrong turning, the driver stopped the car, reversed back, the reversing car stalled just in front of another one of the plotters, 19-year-old Gavrilo Princip. Seizing the moment he drew his pistol and fired two shots at the car. He did not miss. The first hit Franz Ferdinand in the neck, the other hit Sofia. Both died minutes later. Princip was prevented from shooting himself by a sharp-witted bystander and eventually stood trial. 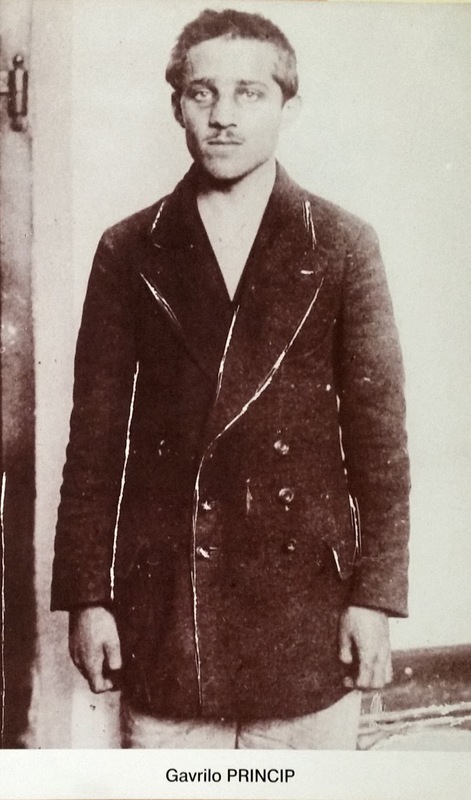 The assassins were all arrested – some were later executed, but Princip was too young for the death penalty and was thus sentenced to 20 years’ imprisonment. He was incarcerated at the Theresienstadt prison ( which later gained even more notoriety as a Nazi concentration camp ) under harsh conditions – from which he died less than four years later from tuberculosis. 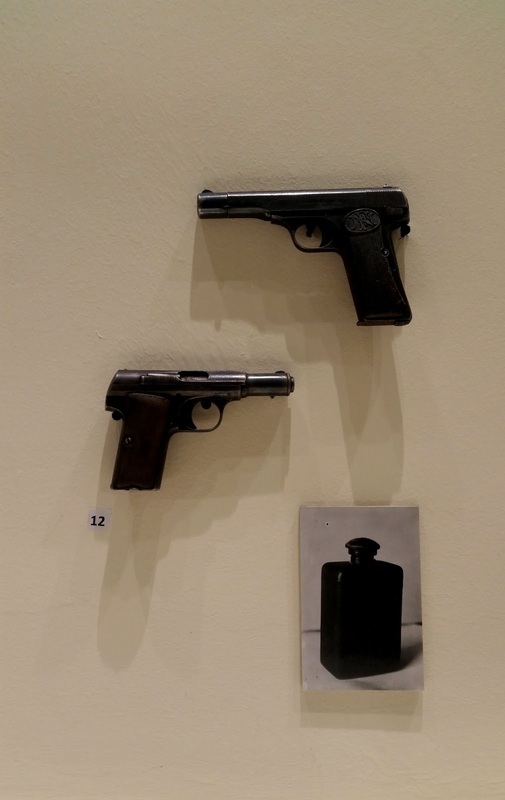 If the driver had not been reminded and continued on his way, Princip would not have killed Franz Ferdinand and events might have been very different. 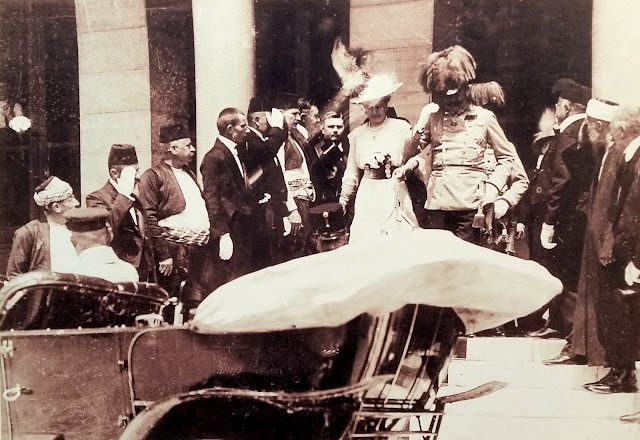 As it was, the assassination sparked off what was to become the First World War: when the Austro-Hungarians got wind of Serbian Military Intelligence involvement in the assassination plot, this was used as the reason to declare war on Serbia. 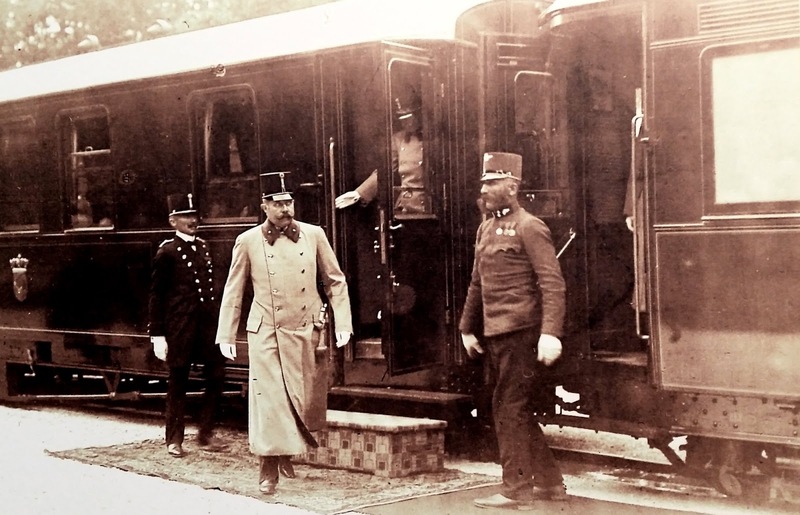 Alliances between various countries meant that soon much of Europe was plunged into the extensive bloodletting that the "Great War" of 1914 to 1918 turned into. Thus young Gavrilo Princip can be said to have shaped the course of history in the 20th century – although it is quite likely that war would have broken out anyway, given the political tensions and military mobilizations of the time. Given the momentous events caused by the assassination I was expecting to be able to find the place quite easily. 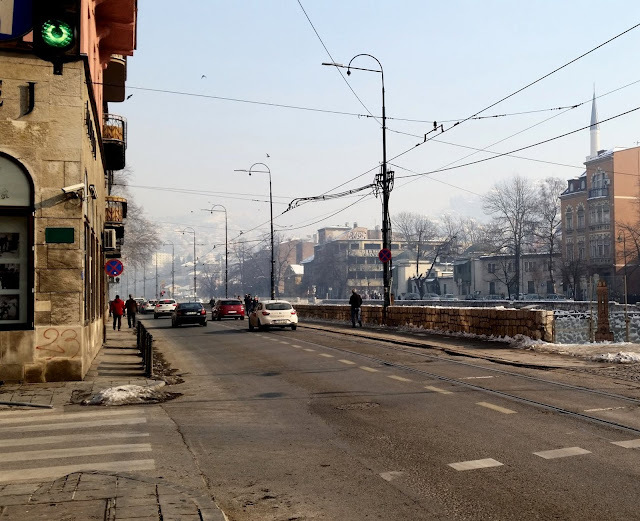 My research led me to the Latin Bridge and the Museum Sarajevo, so I went looking around for a giant neon sign pointing to the exact spot. There wasn’t anything obvious. After hunting around I discovered a small plaque on the wall of the Museum indicating this was the place where it had happened. Talk about understated. 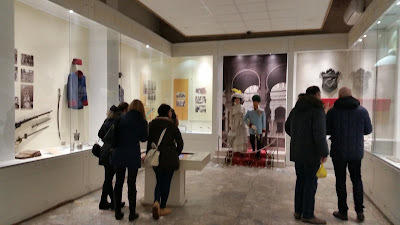 The way the Sarajevo events of 1914, and the roles of Gavrilo Princip and Franz Ferdinand, were commemorated afterwards bears witness to the changeability of attitudes towards and classifications of important historical events: first a pompously large monument/shrine to the Archduke was erected – while Princip was obviously denounced as nothing but a murderer. The Austro-Hungarian monument/shrine was later removed under Serbian/Croatian rule after World War One. Instead, the memory of the assassins was now celebrated and a memorial plaque erected that almost praised them – and the Latin Bridge was renamed after Princip. In other words, he was now rather regarded as a national hero ( and Franz Ferdinand as a member of the former imperialist oppressors ). 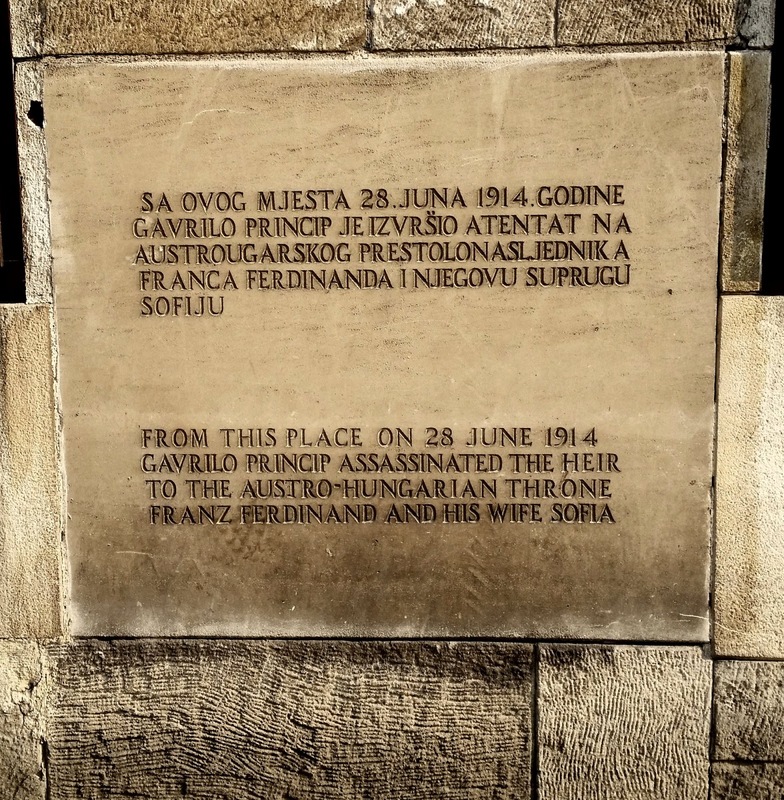 When the Nazis took Sarajevo during WWII, the memorial plaque for Princip was removed and he was even denounced as "Jew" ( in that typical Nazi reflex ). The pendulum swung back yet again after the partisans under Tito liberated the country from the Nazis and formed communist Yugoslavia – so Princip could once again be regarded as a national hero and pioneer of Yugoslavia's struggle for freedom.